The pictures in question are from the Craig Smillie sketchblog, which as the name implies contains sketches by Craig. Craig is from Glasgow and likes the Mediterranean, but over Easter visited Islay on a Hebrides trip. 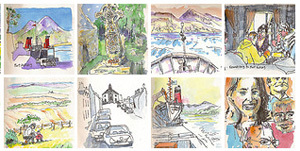 You can find all of the sketches from the trip in his Hebrides Trip, Easter 2011 set. Of the 28 sketches in the set 14 are from Islay or at least Islay visit related (e.g. Tarbert, which you of course pass on the way to the Islay ferry from Kennacraig). Some of my favourites include Port Askaig, Islay, Kildalton Cross, Islay and Portnahaven, Islay. A famous view reduced to the basics is Bowmore, Islay. And finally I quite like Loch Gruinart, Islay. How about you?